These were not irreligious men. Yet there are those who spread the falsehood that the nation founded by these people was intended to be hostile to faith in the public square. 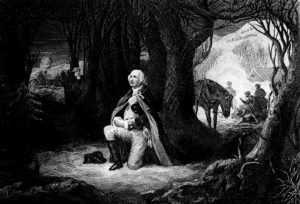 There is a straight line of reverence for one true God that runs from the settlers writing the Mayflower Compact to the patriots of liberty declaring independencefrom the mighty British Empire, and from thence to the statesmen who hashed out the Constitution of the new United States.